This article is about the Fleischmann–Pons claims of nuclear fusion at room temperature, and subsequent research. For the original use of the term ‘cold fusion’, see Muon-catalyzed fusion. For all other definitions, see Cold fusion (disambiguation). Cold fusion is a hypothetical type of nuclear reaction that would occur at, or near, room temperature, compared with temperatures in the millions of degrees that are required for “hot” fusion. It was proposed to explain reports of anomalously high energy generation under certain specific laboratory conditions. It has been rejected by the mainstream scientific community because the original experimental results could not be replicated consistently and reliably, and because there is no accepted theoretical model of cold fusion. Cold fusion gained attention after reports in 1989 by Stanley Pons and Martin Fleischmann, then one of the world’s leading electrochemists, that their apparatus had produced anomalous heat (“excess heat”), of a magnitude they asserted would defy explanation except in terms of nuclear processes. They further reported measuring small amounts of nuclear reaction byproducts, including neutrons and tritium. The small tabletop experiment involved electrolysis of heavy water on the surface of a palladium (Pd) electrode. The reported results received wide media attention, and raised hopes of a cheap and abundant source of energy. Many scientists tried to replicate the experiment with the few details available. Hopes fell with the large number of negative replications, the withdrawal of many positive replications, the discovery of flaws and sources of experimental error in the original experiment, and finally the discovery that Fleischmann and Pons had not actually detected nuclear reaction byproducts. By late 1989, most scientists considered cold fusion claims dead, and cold fusion subsequently gained a reputation as pathological science. In 1989, a review panel organized by the United States Department of Energy (DOE) found that the evidence for the discovery of a new nuclear process was not persuasive enough to start a special program, but was “sympathetic toward modest support” for experiments “within the present funding system.” A second DOE review, convened in 2004 to look at new research, reached conclusions similar to the first. Support within the then-present funding system did not occur. A small community of researchers continues to investigate cold fusion, now often preferring the designation low-energy nuclear reactions (LENR). Some have reported that under certain conditions they observe excess heat effects by interaction of hydrogen or deuterium with palladium, nickel or platinum. Since cold fusion articles are rarely published in peer-reviewed scientific journals, the results do not receive as much scrutiny as more mainstream topics. Nuclear fusion occurs at temperatures in the tens of millions of degrees. For over 100 years there has been speculation that nuclear fusion might happen at much lower temperatures by fusing hydrogen absorbed in a metal catalyst. In 1989, a claim by Stanley Pons and Martin Fleischmann (then one of the world’s leading electrochemists) that such cold fusion had been observed caused a brief media sensation before other scientists began heavily criticizing their claim as being incorrect after many failed to replicate the excess heat. Since the initial announcement, cold fusion research has continued by a small community of committed researchers convinced that such reactions do happen and hoping to gain wider recognition for their experimental evidence. The ability of palladium to absorb hydrogen was recognized as early as the nineteenth century by Thomas Graham. In the late 1920s, two Austrian born scientists, Friedrich Paneth and Kurt Peters, originally reported the transformation of hydrogen into helium by spontaneous nuclear catalysis when hydrogen was absorbed by finely divided palladium at room temperature. However, the authors later retracted that report, acknowledging that the helium they measured was due to background from the air. In 1927, Swedish scientist J. Tandberg stated that he had fused hydrogen into helium in an electrolytic cell with palladium electrodes. On the basis of his work, he applied for a Swedish patent for “a method to produce helium and useful reaction energy”. After deuterium was discovered in 1932, Tandberg continued his experiments with heavy water. Due to Paneth and Peters’s retraction, Tandberg’s patent application was eventually denied. His application for a patent in 1927 was denied as he could not explain the physical process. The term “cold fusion” was used as early as 1956 in a New York Times article about Luis W. Alvarez‘s work on muon-catalyzed fusion. E. Paul Palmer of Brigham Young University also used the term “cold fusion” in 1986 in an investigation of “geo-fusion”, the possible existence of fusion in a planetary core. However, Palmer and Jones used the term “piezonuclear fusion”, coined by Jones. Martin Fleischmann of the University of Southampton and Stanley Pons of the University of Utah hypothesized that the high compression ratio and mobility of deuterium that could be achieved within palladium metal using electrolysis might result in nuclear fusion. To investigate, they conducted electrolysis experiments using a palladium cathode and heavy water within a calorimeter, an insulated vessel designed to measure process heat. Current was applied continuously for many weeks, with the heavy water being renewed at intervals. Some deuterium was thought to be accumulating within the cathode, but most was allowed to bubble out of the cell, joining oxygen produced at the anode. For most of the time, the power input to the cell was equal to the calculated power leaving the cell within measurement accuracy, and the cell temperature was stable at around 30°C. But then, at some point (in some of the experiments), the temperature rose suddenly to about 50°C without changes in the input power. These high temperature phases would last for two days or more and would repeat several times in any given experiment once they had occurred. The calculated power leaving the cell was significantly higher than the input power during these high temperature phases. Eventually the high temperature phases would no longer occur within a particular cell. In 1988, Fleischmann and Pons applied to the United States Department of Energy for funding towards a larger series of experiments. Up to this point they had been funding their experiments using a small device built with $100,000 out-of-pocket. The grant proposal was turned over for peer review, and one of the reviewers was Steven E. Jones of Brigham Young University. Jones had worked for some time on muon-catalyzed fusion, a known method of inducing nuclear fusion without high temperatures, and had written an article on the topic entitled “Cold nuclear fusion” that had been published in Scientific American in July 1987. Fleischmann and Pons and co-workers met with Jones and co-workers on occasion in Utah to share research and techniques. During this time, Fleischmann and Pons described their experiments as generating considerable “excess energy”, in the sense that it could not be explained by chemical reactions alone. They felt that such a discovery could bear significant commercial value and would be entitled to patent protection. Jones, however, was measuring neutron flux, which was not of commercial interest. To avoid future problems, the teams appeared to agree to simultaneously publish their results, though their accounts of their March 6 meeting differ. In mid-March 1989, both research teams were ready to publish their findings, and Fleischmann and Jones had agreed to meet at an airport on March 24 to send their papers to Nature via FedEx. Fleischmann and Pons, however, pressured by the University of Utah, which wanted to establish priority on the discovery, broke their apparent agreement, submitting their paper to the Journal of Electroanalytical Chemistry on March 11, and disclosing their work via a press release and press conference on March 23. Jones, upset, faxed in his paper to Nature after the press conference. Fleischmann and Pons’ announcement drew wide media attention. Cold fusion was proposing the counterintuitive idea that a nuclear reaction could be caused to occur inside a chemically bound crystal structure. But the 1986 discovery of high-temperature superconductivity had made the scientific community more open to revelations of unexpected scientific results that could have huge economic repercussions and that could be replicated reliably even if they had not been predicted by established conjecture. And many scientists were also reminded of the Mössbauer effect, a process involving nuclear transitions in a solid. Its discovery 30 years earlier had also been unexpected, though it was quickly replicated and explained within the existing physics framework. Although the experimental protocol had not been published, physicists in several countries attempted, and failed, to replicate the excess heat phenomenon. The first paper submitted to Nature reproducing excess heat, although it passed peer-review, was rejected because most similar experiments were negative and there were no theories that could explain a positive result; this paper was later accepted for publication by the journal Fusion Technology. Nathan Lewis, professor of chemistry at the California Institute of Technology, led one of the most ambitious validation efforts, trying many variations on the experiment without success, while CERN physicist Douglas R. O. Morrison said that “essentially all” attempts in Western Europe had failed. Even those reporting success had difficulty reproducing Fleischmann and Pons’ results. On April 10, 1989, a group at Texas A&M University published results of excess heat and later that day a group at the Georgia Institute of Technology announced neutron production—the strongest replication announced up to that point due to the detection of neutrons and the reputation of the lab. In 12 April Pons was acclaimed at an ACS meeting. But Georgia Tech retracted their announcement in 13 April, explaining that their neutron detectors gave false positives when exposed to heat. Another attempt at independent replication, headed by Robert Huggins at Stanford University, which also reported early success with a light water control, became the only scientific support for cold fusion in the 26 April US Congress hearings. [text 3] But when he finally presented his results he reported an excess heat of only one degree celsius, a result that could be explained by chemical differences between heavy and light water in the presence of lithium. [notes 1] He had not tried to measure any radiation and his research was derided by scientists who saw it later. For the next six weeks, competing claims, counterclaims, and suggested explanations kept what was referred to as “cold fusion” or “fusion confusion” in the news. In April 1989, Fleischmann and Pons published a “preliminary note” in the Journal of Electroanalytical Chemistry. This paper notably showed a gamma peak without its corresponding Compton edge, which indicated they had made a mistake in claiming evidence of fusion byproducts. Fleischmann and Pons replied to this critique, but the only thing left clear was that no gamma ray had been registered and that Fleischmann refused to recognize any mistakes in the data. A much longer paper published a year later went into details of calorimetry but did not include any nuclear measurements. On April 30, 1989, cold fusion was declared dead by the New York Times. The Times called it a circus the same day, and the Boston Herald attacked cold fusion the following day. On May 1, 1989, the American Physical Society held a session on cold fusion in Baltimore, including many reports of experiments that failed to produce evidence of cold fusion. At the end of the session, eight of the nine leading speakers stated that they considered the initial Fleischmann and Pons claim dead, with the ninth, Johann Rafelski, abstaining. Steven E. Koonin of Caltech called the Utah report a result of “the incompetence and delusion of Pons and Fleischmann,” which was met with a standing ovation. Douglas R. O. Morrison, a physicist representing CERN, was the first to call the episode an example of pathological science. On May 4, due to all this new criticism, the meetings with various representatives from Washington were cancelled. From May 8 only the A&M tritium results kept cold fusion afloat. The United States Department of Energy organized a special panel to review cold fusion theory and research. The panel issued its report in November 1989, concluding that results as of that date did not present convincing evidence that useful sources of energy would result from the phenomena attributed to cold fusion. The panel noted the large number of failures to replicate excess heat and the greater inconsistency of reports of nuclear reaction byproducts expected by established conjecture. Nuclear fusion of the type postulated would be inconsistent with current understanding and, if verified, would require established conjecture, perhaps even theory itself, to be extended in an unexpected way. The panel was against special funding for cold fusion research, but supported modest funding of “focused experiments within the general funding system.” Cold fusion supporters continued to argue that the evidence for excess heat was strong, and in September 1990 the National Cold Fusion Institute listed 92 groups of researchers from 10 different countries that had reported corroborating evidence of excess heat, but they refused to provide any evidence of their own arguing that it could endanger their patents. However, no further DOE nor NSF funding resulted from the panel’s recommendation. By this point, however, academic consensus had moved decidedly toward labeling cold fusion as a kind of “pathological science”. In March 1990 Dr. Michael H. Salamon, a Utah physicist, and nine co-authors reported negative results. University faculty were then “stunned” when a lawyer representing Pons and Fleischmann demanded the Salamon paper be retracted under threat of a lawsuit. The lawyer later apologized; Fleischmann defended the threat as a legitimate reaction to alleged bias displayed by cold-fusion critics. In early May 1990 one of the two A&M researchers, Kevin Wolf, acknowledged the possibility of spiking, but said that the most likely explanation was tritium contamination in the palladium electrodes or simply contamination due to sloppy work. In June 1990 an article in Science by science writer Gary Taubes destroyed the public credibility of the A&M tritium results when it accused its group leader John Bockris and one of his graduate students of spiking the cells with tritium. In October 1990 Wolf finally said that the results were explained by tritium contamination in the rods. An A&M cold fusion review panel found that the tritium evidence was not convincing and that, while they couldn’t rule out spiking, contamination and measurements problems were more likely explanations,[text 4] and Bockris never got support from his faculty to resume his research. On 1 January 1991, Pons left his tenure, and both he and Fleischmann quietly left the United States. In 1992 they resumed research with Toyota Motor Corporation‘s IMRA lab in France. Fleischmann left for England in 1995, and the contract with Pons was not renewed in 1998 after spending $40 million with no tangible results. The IMRA laboratory was closed in 1998 after spending £12 million on cold fusion work. Pons has made no public declarations since, and only Fleischmann continued giving talks and publishing papers. Mostly in the 1990s several books were published that were critical of cold fusion research methods and the conduct of cold fusion researchers. Over the years several books have appeared that defended them. After 1991, cold fusion research continued in relative obscurity, conducted by groups that had increasing difficulty securing public funding and keeping programs open. Research continues today in a few specific venues, but the wider scientific community has generally marginalized the research being done and researchers have had difficulty publishing in mainstream journals. The Boston Globe estimated in 2004 that there were only 100 to 200 researchers working in the field, most suffering damage to their reputation and career. Back in 1991 a review by a cold fusion proponent had calculated “about 600 scientists”. Small but committed groups of cold fusion researchers have continued to conduct experiments using Fleischmann and Pons electrolysis set-ups in spite of the rejection by the mainstream community. Often they prefer to name their field Low Energy Nuclear Reactions (LENR) or Chemically Assisted Nuclear Reactions (CANR), also Lattice Assisted Nuclear Reactions (LANR), Condensed Matter Nuclear Science (CMNS) and Lattice Enabled Nuclear Reactions; one of the reasons being to avoid the negative connotations associated with “cold fusion”. The new names avoid making bold implications, like implying that fusion is happening on them. Proponents see them as a more accurate description of the theories they put forward. Also in the 1990s, India stopped its research in cold fusion at the Bhabha Atomic Research Centre because of the lack of consensus among mainstream scientists and the US denunciation of the research. Yet, in 2008, the National Institute of Advanced Studies recommended the Indian government to revive this research. Projects were commenced at the Chennai‘s Indian Institute of Technology, the Bhabha Atomic Research Centre and the Indira Gandhi Centre for Atomic Research. However, there is still skepticism among scientists and, for all practical purposes, research is still stopped. In 2006–2007 the Italian Ministry of Economic Development founded a research program, which claimed to have found excess power up to 500%. Since the Fleischmann and Pons announcement, the Italian National agency for new technologies, Energy and sustainable economic development (ENEA) has funded Franco Scaramuzzi’s research into whether excess heat can be measured from metals loaded with deuterium gas. Such research is distributed across ENEA departments, CNR Laboratories, INFN, universities and industrial laboratories in Italy, where the group continues to try to achieve reliable reproducibility (i.e. getting the phenomena to happen in every cell, and inside a certain frame of time). In 2009 ENEA hosted the 15th cold fusion conference. In 1999 the Japan C-F Research Society was established to promote the independent research into cold fusion that continued in Japan. The society holds annual meetings; the 12th meeting took place on December 17–18, 2011 at Kobe University. In May 2008 Japanese researcher Yoshiaki Arata (Osaka University) demonstrated an experiment that produced heat when deuterium gas was introduced into a cell containing a mixture of palladium and zirconium oxide. [text 5] In an August 2009 peer-reviewed paper Akira Kitamura (Kobe University) et al. reported replication of this experiment. Replication of earlier work by Arata had been claimed by McKubre at SRI. U.S. Navy researchers at the Space and Naval Warfare Systems Center (SPAWAR) in San Diego have been studying cold fusion since 1989. In 2002, they released a two-volume report, “Thermal and nuclear aspects of the Pd/D2O system,” with a plea for funding. This and other published papers prompted the 2004 DOE review. A grant of $5.5 million given by Sidney Kimmel in February 2012 to the University of Missouri was used to establish the Sidney Kimmel Institute for Nuclear Renaissance (SKINR). The grant is intended to support research into the interactions of hydrogen with palladium, nickel or platinum at extreme conditions. In March 2013 Graham K. Hubler, a nuclear physicist who worked for the Naval Research Laboratory for 40 years, was named director. One of the SKINR projects is to replicate a 1991 experiment in which Prelas says bursts of millions of neutrons a second were recorded, which was stopped because “his research account had been frozen”. He claims that the new experiment has already seen “neutron emissions at similar levels to the 1991 observation”. In January 2011 inventor Andrea Rossi together with researcher Sergio Focardi from the University of Bologna claimed to have successfully demonstrated commercially viable cold fusion in a device called an Energy Catalyzer. Other inventors and start-up companies have made similar claims in the past, but no commercial devices have ever appeared on the market. The decline of publications in cold fusion has been described as a “failed information epidemic”. [text 7] The sudden surge of supporters until roughly 50% of scientists support the theory, followed by a decline until there is only a very small number of supporters, has been described as a characteristic of pathological science. [text 8][notes 3] The lack of a shared set of unifying concepts and techniques has prevented the creation of a dense network of collaboration in the field; researchers perform efforts in their own and in disparate directions, making the transition to “normal” science more difficult. Cold fusion reports continued to be published in a small cluster of specialized journals like Journal of Electroanalytical Chemistry and Il Nuovo Cimento. Some papers also appeared in Journal of Physical Chemistry, Physics Letters A, International Journal of Hydrogen Energy, and a number of Japanese and Russian journals of physics, chemistry, and engineering. Since 2005, Naturwissenschaften has published cold fusion papers; in 2009, the journal named a cold fusion researcher to its editorial board. The Nobel Laureate Julian Schwinger declared himself a supporter of cold fusion in the fall of 1989, after much of the response to the initial reports had turned negative. He tried to publish his theoretical paper “Cold Fusion: A Hypothesis” in Physical Review Letters, but the peer reviewers rejected it so harshly that he felt deeply insulted, and he resigned from the American Physical Society (publisher of PRL) in protest. Cold fusion researchers were for many years unable to get papers accepted at scientific meetings, prompting the creation of their own conferences. The first International Conference on Cold Fusion (ICCF) was held in 1990, and has met every 12 to 18 months since. Attendees at some of the early conferences were described as offering no criticism to papers and presentations for fear of giving ammunition to external critics; thus allowing the proliferation of crackpots and hampering the conduct of serious science. Critics and skeptics stopped attending these conferences, with the notable exception of Douglas Morrison, who died in 2001. With the founding in 2004 of the International Society for Condensed Matter Nuclear Science (ISCMNS), the conference was renamed the International Conference on Condensed Matter Nuclear Science (the reasons are explained in the “ongoing” section), but reverted to the old name in 2008. Cold fusion research is often referenced by proponents as “low-energy nuclear reactions”, or LENR, but according to sociologist Bart Simon the “cold fusion” label continues to serve a social function in creating a collective identity for the field. On 22–25 March 2009, the American Chemical Society meeting included a four-day symposium in conjunction with the 20th anniversary of the announcement of cold fusion. Researchers working at the U.S. Navy’s Space and Naval Warfare Systems Center (SPAWAR) reported detection of energetic neutrons using a heavy water electrolysis set-up and a CR-39 detector, a result previously published in Die Naturwissenschaften. The authors claim that these neutrons are indicative of nuclear reactions; without quantitative analysis of the number, energy, and timing of the neutrons and exclusion of other potential sources, this interpretation is unlikely to find acceptance by the wider scientific community. Around 1998 the University of Utah had already dropped its research after spending over $1 million, and in the summer of 1997 Japan cut off research and closed its own lab after spending $20 million. a pariah field, cast out by the scientific establishment. Between cold fusion and respectable science there is virtually no communication at all. Cold fusion papers are almost never published in refereed scientific journals, with the result that those works don’t receive the normal critical scrutiny that science requires. On the other hand, because the Cold-Fusioners see themselves as a community under siege, there is little internal criticism. Experiments and theories tend to be accepted at face value, for fear of providing even more fuel for external critics, if anyone outside the group was bothering to listen. In these circumstances, crackpots flourish, making matters worse for those who believe that there is serious science going on here. While significant progress has been made in the sophistication of calorimeters since the review of this subject in 1989, the conclusions reached by the reviewers today are similar to those found in the 1989 review. The current reviewers identified a number of basic science research areas that could be helpful in resolving some of the controversies in the field, two of which were: 1) material science aspects of deuterated metals using modern characterization techniques, and 2) the study of particles reportedly emitted from deuterated foils using state-of-the-art apparatus and methods. The reviewers believed that this field would benefit from the peer-review processes associated with proposal submission to agencies and paper submission to archival journals. In a 2009 BBC article on an American Chemical Society’s meeting on cold fusion, particle physicist Frank Close was quoted stating that the problems that plagued the original cold fusion announcement are still happening (as of 2009): results from studies are still not being independently verified and inexplicable phenomena encountered are being labelled as “cold fusion” even if they are not, in order to attract the attention of journalists. A small number of old and new researchers have remained interested in investigating cold fusion. In 2007, one such researcher concluded that: “nuclear reactions not predicted by current theories occur in solids, during electrolysis, gas loading and gas discharge [experiments]”. Well nuclear fusion… most of the experts who I trust think that’s at least fifty years away. There are some very intriguing explorations of what used to be called cold fusion – they don’t like that term any more. It’s still speculative. We can always hope for a breakthrough, but it’s probably not smart to bet on fusion in the near term. Electrolysis cells can be either open cell or closed cell. In open cell systems, the electrolysis products, which are gaseous, are allowed to leave the cell. In closed cell experiments, the products are captured, for example by catalytically recombining the products in a separate part of the experimental system. These experiments generally strive for a steady state condition, with the electrolyte being replaced periodically. There are also “heat after death” experiments, where the evolution of heat is monitored after the electric current is turned off. 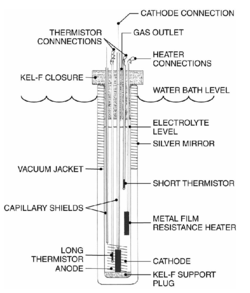 The most basic setup of a cold fusion cell consists of two electrodes submerged in a solution containing palladium and heavy water. The electrodes are then connected to a power source to transmit electricity from one electrode to the other through the solution. Even when anomalous heat is reported, it can take weeks for it to begin to appear – this is known as the “loading time,” the time required to saturate the palladium electrode with hydrogen (see “Loading ratio” section). An excess heat observation is based on an energy balance. Various sources of energy input and output are continuously measured. Under normal conditions, the energy input can be matched to the energy output to within experimental error. In experiments such as those run by Fleischmann and Pons, a cell operating steadily at one temperature transitions to operating at a higher temperature with no increase in applied current. If higher temperatures were real, and not experimental artifact, the energy balance would show an unaccounted term. In the Fleischmann and Pons experiments, the rate of inferred excess heat generation was in the range of 10–20% of total input, though this could not be reliably replicated by most researchers. Researcher Nathan Lewis discovered that the excess heat in Fleischmann and Pons’s original paper was not measured, but estimated from measurements that didn’t have any excess heat. Unable to produce excess heat or neutrons, and with positive experiments being plagued by errors and giving disparate results, most researchers declared that heat production was not a real effect and ceased working on the experiments. In 1993, after the initial discrediting, Fleischmann reported “heat-after-death” experiments: where excess heat was measured after the electric current supplied to the electrolytic cell was turned off. This type of report also became part of subsequent cold fusion claims. “Triple tracks” in a CR-39 plastic radiation detector claimed as evidence for neutron emission from palladium deuteride. Known instances of nuclear reactions, aside from producing energy, also produce nucleons and particles on readily observable ballistic trajectories. In support of their claim that nuclear reactions took place in their electrolytic cells, Fleischmann and Pons reported a neutron flux of 4,000 neutrons per second, as well as detections of tritium. The classical branching ratio for previously known fusion reactions that produce tritium would predict, with 1 watt of power, the production of 1012 neutrons per second, levels that would have been fatal to the researchers. In 2009, Mosier-Boss et al. reported what they called the first scientific report of highly energetic neutrons, using CR-39 plastic radiation detectors, but the claims cannot be validated without a quantitative analysis of neutrons. Several medium and heavy elements like calcium, titanium, chromium, manganese, iron, cobalt, copper and zinc have been reported as detected by several researchers, like Tadahiko Mizuno or George Miley. The report presented to the DOE in 2004 indicated that deuterium-loaded foils could be used to detect fusion reaction products and, although the reviewers found the evidence presented to them as inconclusive, they indicated that those experiments did not use state-of-the-art techniques. In response to skepticism about the lack of nuclear products, cold fusion researchers have tried to capture and measure nuclear products correlated with excess heat. Considerable attention has been given to measuring 4He production. However, the reported levels are very near to background, so contamination by trace amounts of helium normally present in the air cannot be ruled out. In the report presented to the DOE in 2004, the reviewers’ opinion was divided on the evidence for 4He; with the most negative reviews concluding that although the amounts detected were above background levels, they were very close to them and therefore could be caused by contamination from air. One of the main criticisms of cold fusion was that deuteron-deuteron fusion into helium was expected to result in the production of gamma rays—which were not observed and were not observed in subsequent cold fusion experiments. Cold fusion researchers have since claimed to find X-rays, helium, neutrons and even nuclear transmutations. Some of them even claim to have found them using only light water and nickel cathodes. The 2004 DOE panel expressed concerns about the poor quality of the theoretical framework cold fusion proponents presented to account for the lack of gamma rays. Many years after the 1989 experiment, cold fusion researchers still haven’t agreed on a single theoretical explanation or on a single experimental method that can produce replicable results  and continue to offer new proposals, which haven’t convinced mainstream scientists. Hydrogen and its isotopes can be absorbed in certain solids, including palladium hydride, at high densities. This creates a high partial pressure, reducing the average separation of hydrogen isotopes, but nowhere near enough to create the fusion rates claimed in the original experiment. It was proposed that a higher density of hydrogen inside the palladium and a lower potential barrier could raise the possibility of fusion at lower temperatures than expected from a simple application of Coulomb’s law. Electron screening of the positive hydrogen nuclei by the negative electrons in the palladium lattice was suggested to the 2004 DOE commission, but the panel found the theoretical explanations (Charge Element 2) to be the weakest part of cold fusion claims. Researchers started proposing alternative explanations for Fleischmann and Pons’ results even before various other labs reported null results. Skeptics have called cold fusion explanations ad hoc and lacking rigor, and state that they are used by proponents simply to disregard the negative experiments—a symptom of pathological science. Because nuclei are all positively charged, they strongly repel one another. Normally, in the absence of a catalyst such as a muon, very high kinetic energies are required to overcome this repulsion. Extrapolating from known fusion rates, the rate for uncatalyzed fusion at room-temperature energy would be 50 orders of magnitude lower than needed to account for the reported excess heat. In muon-catalyzed fusion there are more fusions because the presence of the muon causes deuterium nuclei to be 207 times closer than in ordinary deuterium gas. But deuterium nuclei inside a palladium lattice are further apart than in deuterium gas, and there should be fewer fusion reactions, not more. Paneth and Peters in the 1920s already knew that palladium can absorb up to 900 times its own volume of hydrogen gas, storing it at several thousands of times the atmospheric pressure. This led them to believe that they could increase the nuclear fusion rate by simply loading palladium rods with hydrogen gas. Tandberg then tried the same experiment but used electrolysis to make palladium absorb more deuterium and force the deuterium further together inside the rods, thus anticipating the main elements of Fleischmann and Pons’ experiment. They all hoped that pairs of hydrogen nuclei would fuse together to form helium nuclei, which at the time were very needed in Germany to fill zeppelins, but no evidence of helium or of increased fusion rate was ever found. This was also the belief of geologist Palmer, who convinced Steve Jones that the helium-3 occurring naturally in Earth came from the fusion of deuterium inside catalysts like palladium. This led Jones to independently make the same experimental setup as Fleischmann and Pons (a palladium cathode submerged in heavy water, absorbing deuterium via electrolysis). Fleischmann and Pons had the same incorrect belief, but they calculated the pressure to be of 1027 atmospheres, when CF experiments only achieve a ratio of one to one, which only has between 10,000 and 20,000 atmospheres. [text 10] John R. Huizenga says they had misinterpreted the Nernst equation, leading them to believe that there was enough pressure to bring deuterons so close to each other that there would be spontaneous fusions. The known rate of the decay process together with the inter-atomic spacing in a metallic crystal makes heat transfer of the 24 MeV excess energy into the host metal lattice prior to the intermediary’s decay inexplicable in terms of conventional understandings of momentum and energy transfer, and even then we would see measurable levels of radiations. Also, experiments indicate that the ratios of deuterium fusion remain constant at different energies. In general, pressure and chemical environment only cause small changes to fusion ratios. An early explanation invoked the Oppenheimer–Phillips process at low energies, but its magnitude was too small to explain the altered ratios. Michael McKubre working on deuterium gas-based cold fusion cell used by SRI International. Cold fusion researchers (McKubre since 1994, ENEA in 2011) have posited that a cell that was loaded with a deuterium/palladium ratio lower than 100% (or 1:1) would never produce excess heat. Storms added in 1996 that the load ratio has to be maintained during many hours of electrolysis before the effects appear. Since most of the negative replications in 1989–1990 didn’t report their ratios, this has been proposed as an explanation for failed replications. This loading ratio is tricky to obtain, and some batches of palladium never reach it because the pressure causes cracks in the palladium, allowing the deuterium to escape. Unfortunately, Fleischmann and Pons never disclosed the deuterium/palladium ratio achieved in their cells, there are no longer any batches of the palladium used by Fleischmann and Pons (because the supplier uses now a different manufacturing process), and researchers still have problems finding batches of palladium that achieve heat production reliably. According to John R. Huizenga, who co-chaired the DOE 1989 panel, if unexplained excess heat is not accompanied by a commensurate amount of nuclear products, then it must not be interpreted as nuclear in origin, but as a measuring error. Control experiments are part of the scientific method to prove that the measured effects do not happen by chance, but are direct results of the experiment. One of the points of criticism of Fleischmann and Pons was the lack of control experiments. Although details have not surfaced, it appears that the University of Utah forced the 23 March 1989 Fleischmann and Pons announcement to establish priority over the discovery and its patents before the joint publication with Jones. The Massachusetts Institute of Technology (MIT) announced on 12 April 1989 that it had applied for its own patents based on theoretical work of one of its researchers, Peter L. Hagelstein, who had been sending papers to journals from the 5th to the 12th of April. On 2 December 1993 the University of Utah licensed all its cold fusion patents to ENECO, a new company created to profit from cold fusion discoveries, and on March 1998 it said that it would no longer defend its patents. A U.S. patent might still be granted when given a different name to disassociate it from cold fusion, though this strategy has had little success in the US: the same claims that need to be patented can identify it with cold fusion, and most of these patents cannot avoid mentioning Fleischmann and Pons’ research due to legal constraints, thus alerting the patent reviewer that it is a cold-fusion-related patent. David Voss said in 1999 that some patents that closely resemble cold fusion processes, and that use materials used in cold fusion, have been granted by the USPTO. The inventor of three such patents had his applications initially rejected when they were reviewed by experts in nuclear science; but then he rewrote the patents to focus more in the electrochemical parts so they would be reviewed instead by experts in electrochemistry, who approved them. When asked about the resemblance to cold fusion, the patent holder said that it used nuclear processes involving “new nuclear physics” unrelated to cold fusion. Melvin Miles was granted in 2004 a patent for a cold fusion device, and in 2007 he described his efforts to remove all instances of “cold fusion” from the patent description to avoid having it rejected outright. In Jan, 2014 Forbes reported that “The Department of Energy included low energy nuclear reactions—which NASA scientists have said could fuel home nuclear reactors—among other representative technologies in a $10 million funding opportunity it announced last fall.” Figure 3 of the FOA includes : “3.6 chemonuclear reactors, low-energy nuclear reactions, nuclear fuel chemistry”. The initial stage solicits short “concept papers”. Selected applicants will then be invited to submit full applications. Approximately twenty grants will be awarded, each lasting at most one year and costing less than $500,000. In Undead Science, sociologist Bart Simon gives some examples of cold fusion in popular culture, saying that some scientists use cold fusion as a synonym for outrageous claims made with no supporting proof, and courses of ethics in science give it as an example of pathological science. It has appeared as a joke in Murphy Brown and The Simpsons. It was adopted as a product name by software Coldfusion and a brand of protein bars (Cold Fusion Foods). It has also appeared in advertising as a synonym for impossible science, for example a 1995 advertisement for Pepsi Max. The plot of The Saint, a 1997 action-adventure film, parallels the story of Fleischmann and Pons, although with a different ending. The film might have affected the public perception of cold fusion, pushing it further into the science fiction realm. The plot of Chain Reaction, a 1996 science-fiction film, depicts a scientist discovering a new energy source that burns hydrogen and leaves only water as residue, although it is not left clear whether it is cold fusion or some form of hot fusion. Alan L. Durham (2004), Patent law essentials: a concise guide (2, illustrated ed. ), Greenwood Publishing Group, p. 72 (footnote 30), ISBN 0-275-98205-X, ISBN 9780275982058. Jeffrey G. Sheldon (1992), How to write a patent application (illustrated ed. ), Practising Law Institute, ISBN 0-87224-044-4. ^ 60 Minutes: Once Considered Junk Science, Cold Fusion Gets A Second Look By Researchers, CBS, 2009-04-17. ^ a b Chang, Kenneth (2004-03-25), US will give cold fusion a second look, The New York Times, retrieved 2009-02-08. ^ a b c d Broad 1989b, Goodstein 1994, Platt 1998, Voss 1999, Beaudette 2002, Feder 2005, Adam 2005 “Advocates insist that there is just too much evidence of unusual effects in the thousands of experiments since Pons and Fleischmann to be ignored”, Kruglinksi 2006, Van Noorden 2007, Alfred 2009. calculates between 100 and 200 researchers, with damage to the their careers. ^ a b ‘Cold fusion’ rebirth? New evidence for existence of controversial energy source, American Chemical Society. ^ C. DeW. Van Siclen and S. E. Jones, “Piezonuclear fusion in isotopic hydrogen molecules,” J. Phys. G: Nucl. Phys. 12: 213-221 (March 1986). ^ a b University of Utah, ‘Simple experiment’ results in sustained n-fusion at room temperature for first time, retrieved 28 July 2011. ^ For example, in 1989, the Economist editorialized that the cold fusion “affair” was “exactly what science should be about.” Footlick, JK (1997), Truth and Consequences: how colleges and universities meet public crises, Phoenix: Oryx Press, p. 51, ISBN 978-0-89774-970-1. as cited in Brooks, M (2008), 13 Things That Don’t Make Sense, New York: Doubleday, p. 67, ISBN 978-1-60751-666-8. ^ Broad, William J. 19 April 1989. Stanford Reports Success, The New York Times. ^ Taubes 1993, p. 242 (Boston Herald’s is Tate 1989). ^ Broad, William J. (30 October 1990). “Cold Fusion Still Escapes Usual Checks Of Science”. New York Times. Retrieved 27 November 2013. ^ Taubes 1993, pp. 410–411, 412, 420, the Science article was Taubes 1990, Huizenga 1993, pp. 122, 127–128. ^ National Cold Fusion Institute Records, 1988–1991. ^ Huizenga 1993, pp. 210–211 citing Srinivisan, M., “Nuclear Fusion in an Atomic Lattice: An Update on the International Status of Cold Fusion Research”, Current Science 60: 471. ^ “Our dream is a small fusion power generator in each house”, Times of India, 4 February 2011. ^ a b COLD FUSION – The history of research in Italy (2009) PDF 8.7Mb In the foreword by the president of ENEA the belief is expressed that the cold fusion phenomenon is proved. ^ a b c d “Effetto Fleischmann e Pons: il punto della situazione”, Energia Ambiente e Innovazione (in Italian) (ENEA) (3), May–June 2011. ^ Goodstein, David L. (2010), On Fact and Fraud:Cautionary Tales from the Front Lines of Science, Princeton: Princeton University Press, pp. 87–94, ISBN 0691139660. ^ Journal of Condensed Matter Nuclear Science. ^ a b c “Cold fusion debate heats up again”, BBC, 2009-03-23. ^ Scientists in possible cold fusion breakthrough, AFP, retrieved 2009-03-24. ^ a b Wired News Staff Email (24 March 1998), Cold Fusion Patents Run Out of Steam, Wired. ^ a b US DOE 1989, pp. 7–8, 33, 53–58 (appendix 4.A), Close 1992, pp. 257–258, Huizenga 1993, p. 112, Taubes 1993, pp. 253–254 quoting Howard Kent Birnbaum in the special cold fusion session of the 1989 spring meeting of the Materials Research Society, Park 2000, pp. 17–18, 122, Simon 2002, p. 50 citing Koonin S.E. and M Nauenberg (1989), “Calculated Fusion Rates in Isotopic Hydrogen Molecules”, Nature (339): 690–692, Bibcode:1989Natur.339..690K, doi:10.1038/339690a0. ^ Tate, N. (1989), “MIT bombshell knocks fusion ‘breakthrough’ cold”, Boston Herald (May 1, 1989): 1, ISSN 0738-5854. ^ Broad, William J. (1989-04-13), ‘Cold Fusion’ Patents Sought, New York Times. ^ Daniel C. Rislove (2006), C. The Cold Fusion patents, “A Case Study of Inoperable Inventions: Why Is the USPTO Patenting Pseudoscience?”, Wisconsin Law Review 2006 (4): 1302–1304, footnote 269 in page 1307. ^ Sidney Perkowitz (2010), Hollywood Science: Movies, Science, and the End of the World (illustrated ed. ), Columbia University Press, pp. 113–114, ISBN 978-0-231-14281-6. ^ Brigham Young University discovered Tandberg’s 1927 patent application, and showed it as proof that Utah University didn’t have priority for the discovery of cold fusion, cited in Wilford, John Noble (24 April 1989), “Fusion Furor: Science’s Human Face”, New York Times. ^ Labinger & Weininger 2005, p. 1919 Fleischmann’s paper was challenged in Morrison, R.O. Douglas (28 February 1994). “Comments on claims of excess enthalpy by Fleischmann and Pons using simple cells made to boil”. Phys. Lett. A 185 (5–6): 498–502. Bibcode:1994PhLA..185..498M. doi:10.1016/0375-9601(94)91133-9. ^ Close 1992, pp. 257–258, Huizenga 1993, pp. 33, 47–48, 79, 99–100, 207, 216 “By comparing cathode charging of deuterium into palladium with gas charging for a D7Pd ratio of unity, one obtains an equivalent pressure of 1.5×104 atmospheres, a value more than 20 orders of magnitude (1020) less than the Fleischmann-Pons claimed pressure.”, Huizenga also cites US DOE 2004, pp. 33–34 in chapter IV. Materials Characterization: D. ‘Relevant’ Materials Parameters: 2. Confinement Pressure, which has a similar explanation. Ackermann, Eric (February 2006), “Indicators of failed information epidemics in the scientific journal literature: A publication analysis of Polywater and Cold Nuclear Fusion”, Scientometrics 66 (3): 451–466, doi:10.1007/s11192-006-0033-0. Adam, David (24 March 2005), “In from the cold”, in Rusbringer, Alan, The Guardian (London), retrieved 2008-05-25. Alfred, Randy (2009-03-23), “March 23, 1989: Cold Fusion Gets Cold Shoulder”, Wired. Ball, Phillip (2001), Life’s matrix: a biography of water (illustrated, reprinted ed. ), University of California Press, ISBN 978-0-520-23008-8. Barras, Collin (2009-03-23), “Neutron tracks revive hopes for cold fusion”, New Scientist. Beaudette, Charles G. (2002), Excess Heat & Why Cold Fusion Research Prevailed, South Bristol, Maine: Oak Grove Press, ISBN 0-9678548-3-0. Berger, Eric (2009-03-23), “Navy scientist announces possible cold fusion reactions”, Houston Chronicle. Biberian, Jean-Paul (2007), “Condensed Matter Nuclear Science (Cold Fusion): An Update” (PDF), International Journal of Nuclear Energy Science and Technology 3 (1): 31–42, doi:10.1504/IJNEST.2007.012439. Bird, Alexander (1998), Routledge, ed., Philosophy of Science: Alexander Bird (illustrated, reprint ed. ), London: UCL Press, ISBN 1-85728-504-2. Bowen, Jerry (April 10, 1989), “Science: Nuclear Fusion”, CBS Evening News, retrieved 2008-05-25. Broad, William J. (April 14, 1989), “Georgia Tech Team Reports Flaw In Critical Experiment on Fusion”, New York Times, retrieved 2008-05-25. Broad, William J. (October 31, 1989), “Despite Scorn, Team in Utah Still Seeks Cold-Fusion Clues”, The New York Times: C1. Browne, M. (May 3, 1989), “Physicists Debunk Claim Of a New Kind of Fusion”, New York Times, retrieved 2008-05-25alternative link). Brumfiel, Geoff (2 December 2004), “US review rekindles cold fusion debate. Energy panel split over whether experiments produced power”, Nature news, doi:10.1038/news041129-11. Choi, Charles (2005), “Back to Square One”, Scientific American, retrieved 2008-11-25. Chubb, Scott; McKubre, Michael C. H.; Krivit, Steve B.; Chubb, Talbot; Miley, George =H. ; Swartz, Mitchell; Violante, V.; Stringham, Roger; Fleischmann, Martin; Li, Zing Z.; Biberian, J.P.; Collis, William (2006), Session W41: Cold Fusion, American Physical Society, retrieved 2008-05-25. Close, Frank E. (1992), Too Hot to Handle: The Race for Cold Fusion (2 ed. ), London: Penguin, ISBN 0-14-015926-6. Collins, Harry; Pinch, Trevor (1993), The Golem: What Everyone Should Know About Science (second edition 1998, reprinted 2005 ed. ), Cambridge University Press, ISBN 0-521-64550-6. Crease, Robert; Samios, N.P. (1989), “Cold Fusion confusion”, New York Times Magazine (September 24, 1989): 34–38. Daley, Beth (July 27, 2004), “Heating up a cold theory. MIT professor risks career to reenergize discredited idea”, The Boston Globe. Derry, Gregory Neil (2002), What Science Is and How It Works (reprint, illustrated ed. ), Princeton, New Jersey; Oxford: Princeton University Press, ISBN 978-0-691-09550-9, OCLC 40693869. Feder, Toni (2004), “DOE Warms to Cold Fusion”, Physics Today 57 (4): 27–28, Bibcode:2004PhT….57d..27F, doi:10.1063/1.1752414. Feder, Toni (January 2005), “Cold Fusion Gets Chilly Encore”, Physics Today 58: 31, Bibcode:2005PhT….58a..31F, doi:10.1063/1.1881896. Fleischmann, Martin; Pons, Stanley (1989), “Electrochemically induced nuclear fusion of deuterium”, Journal of Electroanalytical Chemistry 261 (2A): 301–308, doi:10.1016/0022-0728(89)80006-3. Fleischmann, Martin; Pons, Stanley; Anderson, Mark W.; Li, Lian Jun; Hawkins, Marvin (1990), “Calorimetry of the palladium-deuterium-heavy water system”, Journal of Electroanalytical Chemistry 287 (2): 293–348, doi:10.1016/0022-0728(90)80009-U. Fleischmann, Martin; Pons, S. (1993), “Calorimetry of the Pd-D2O system: from simplicity via complications to simplicity”, Physics Letters A 176 (1–2): 118–129, Bibcode:1993PhLA..176..118F, doi:10.1016/0375-9601(93)90327-V.
Fox, Barry (June 25, 1994), “Patents: Cold fusion rides again”, New Scientist (1931), ISSN 0262-4079. Gai, M.; Rugari, S.L. ; France, R.H.; Lund, B.J. ; Zhao, Z.; Davenport, A.J. ; Isaacs, H.S. ; Lynn, K.G. (1989), “Upper limits on neutron and big gamma-ray emission from cold fusion”, Nature 340 (6228): 29–34, Bibcode:1989Natur.340…29G, doi:10.1038/340029a0. Goodstein, David (1994), “Whatever happened to cold fusion?”, American Scholar (Phi Beta Kappa Society) 63 (4): 527–541, ISSN 0003-0937, retrieved 2008-05-25. Hagelstein, Peter L.; McKubre, Michael; Nagel, David; Chubb, Talbot; Hekman, Randall (2004), New Physical Effects in Metal Deuterides (PDF), Washington: US Department of Energy, (manuscript). Hagelstein, Peter L. (2010), “Constraints on energetic particles in the Fleischmann–Pons experiment”, Naturwissenschaften (PDF|format= requires |url= (help)) (Springer) 97 (4): 345–52, Bibcode:2010NW…..97..345H, doi:10.1007/s00114-009-0644-4, PMID 20143040. Hoffman, Nate (1995), A Dialogue on Chemically Induced Nuclear Effects: A Guide for the Perplexed About Cold Fusion, La Grange Park, Illinois: American Nuclear Society, ISBN 0-89448-558-X. Huizenga, John R. (1993), Cold Fusion: The Scientific Fiasco of the Century (2 ed. ), Oxford and New York: Oxford University Press, ISBN 0-19-855817-1. Jayaraman, K.S. (January 17, 2008), “Cold fusion hot again”, Nature India, doi:10.1038/nindia.2008.77, retrieved 2008-12-07. Jones, J.E. ; Hansen, L.D. ; Jones, S.E. ; Shelton, D.S. ; Thorne, J.M. (1995), “Faradaic efficiencies less than 100% during electrolysis of water can account for reports of excess heat in `cold fusion` cells”, Journal of Physical Chemistry 99 (18): 6973–6979, doi:10.1021/j100018a033. Joyce, Christopher (16 June 1990), “Gunfight at the cold fusion corral”, New Scientist (1721): 22, ISSN 0262-4079, retrieved 2009-10-01. Kean, Sam (26 July 2010), “Palladium: The Cold Fusion Fanatics Can’t Get Enough of the Stuff”, Slate, retrieved 2011-07-31. Kitamura, Akita; Nohmi, Takayoshi; Sasaki, Yu; Taniike, Akira; Takahashi, Akito; Seto, Reiko; Fujita, Yushi (2009), “Anomalous Effects in Charging of Pd Powders with High Density Hydrogen Isotopes”, Physics Letter A 373 (35): 3109–3112, Bibcode:2009PhLA..373.3109K, doi:10.1016/j.physleta.2009.06.061. Kozima, Hideo (2006), The Science of the Cold Fusion phenomenon, New York: Elsevier Science, ISBN 0-08-045110-1. Kruglinksi, Susan (2006-03-03), “Whatever Happened To… Cold Fusion?”, Discover Magazine, ISSN 0274-7529, retrieved 2008-06-20. Kowalski, Ludwik (2004), Jones’s manuscript on History of Cold Fusion at BYU, Upper Montclair, New Jersey: csam.montclair.edu, retrieved 2008-05-25. Lewenstein, Bruce V. (1994), Cornell cold fusion archive (PDF), collection n°4451, Division of Rare and Manuscript Collections, Cornell University Library, retrieved 2008-05-25. Mallove, Eugene (1991), Fire from Ice: Searching for the Truth Behind the Cold Fusion Furor, London: Wiley, ISBN 0-471-53139-1. Mengoli, G.; Bernardini, M.; Manduchi, C.; Zannoni, G. (1998), “Calorimetry close to the boiling temperature of the D2O/Pd electrolytic system”, Journal of Electroanalytical Chemistry 444 (2): 155–167, doi:10.1016/S0022-0728(97)00634-7. Mullins, Justin (September 2004), “Cold Fusion Back From the Dead”, IEEE Spectrum 41 (9): 22, doi:10.1109/MSPEC.2004.1330805. Mosier-Boss, Pamela A.; Szpak, Stanislaw; Gordon, Frank E.; Forsley, L.P.G. (2009), “Triple tracks in CR-39 as the result of Pd–D Co-deposition: evidence of energetic neutrons”, Naturwissenschaften 96 (1): 135–142, Bibcode:2009NW…..96..135M, doi:10.1007/s00114-008-0449-x, PMID 18828003. Laurence, William L. (1956-12-30), “Cold Fusion of Hydrogen Atoms; A Fourth Method Pulling Together”, The New York Times: E7. Oriani, Richard A.; Nelson, John C.; Lee, Sung-Kyu; Broadhurst, J. H. (1990), “Calorimetric Measurements of Excess Power Output During the Cathodic Charging of Deuterium into Palladium”, Fusion Technology 18: 652–662, ISSN 0748-1896. Paneth, Fritz; Peters, Kurt (1926), “Über die Verwandlung von Wasserstoff in Helium”, Naturwissenschaften (in German) 14 (43): 956–962, Bibcode:1926NW…..14..956P, doi:10.1007/BF01579126. Park, Robert L (2000), Voodoo Science: The road from foolishness to fraud, Oxford, U.K. & New York: Oxford University Press, ISBN 0-19-860443-2, retrieved 14 November 2010. Petit, Charles (14 March 2009), “Cold panacea: two researchers proclaimed 20 years ago that they’d achieved cold fusion, the ultimate energy solution. The workwent nowhere, but the hope remains”, Science News 175 (6): 20–24, doi:10.1002/scin.2009.5591750622. Platt, Charles (1998), “What if Cold Fusion is Real?”, Wired Magazine (6.11), retrieved 2008-05-25. Pollack, A. (November 17, 1992), “Cold Fusion, Derided in U.S., Is Hot In Japan”, The New York Times. Pollack, A. (August 26, 1997), “Japan, Long a Holdout, is Ending its Quest for Cold Fusion”, New York Times 79: 243, C4. Pool, Robert (28 April 1989), “How cold fusion happened – twice!”, Science 244 (4903): 420, Bibcode:1989Sci…244..420P, doi:10.1126/science.244.4903.420-a, PMID 17807604. Raymo, Chet (10 October 2000), “Some Cold Water for Cold Fusion”, The Boston Globe: E02, archived from the original on 19 October 2000. Reger, Daniel L.; Goode, Scott R.; Ball, David W. (2009), Chemistry: Principles and Practice (3, revised ed. ), Cengage Learning, pp. 814–815, ISBN 978-0-534-42012-3. Rousseau, D. L. (January–February 1992), “Case Studies in Pathological Science: How the Loss of Objectivity Led to False Conclusions in Studies of Polywater, Infinite Dilution and Cold Fusion”, American Scientist 80: 54–63, Bibcode:1992AmSci..80…54R. Schaffer, Michael J. (October 21, 1999), “Historical overview, assessment”, Saeta 1999: 1–3. Sanderson, Katharine (March 29, 2007), “Cold fusion is back at the American Chemical Society”, Nature news, ISSN 0028-0836, retrieved 2009-07-18. Scaramuzzi, F. (2000), “Ten years of cold fusion: an eye-witness account”, Accountability in Research 8 (1&2): 77, ISSN 0898-9621, OCLC 17959730. Seife, Charles (2008), Sun in a Bottle: The Strange History of Fusion and the Science of Wishful Thinking, New York: Viking, ISBN 0-670-02033-8. Shamoo, Adil E.; Resnik, David B. (2003), Oxford University Press US, ed., Responsible Conduct of Research (2, illustrated ed. ), Oxford: Oxford University Press, ISBN 0-19-514846-0. Shanahan, Kirk L. (23 May 2002), “A systematic error in mass flow calorimetry demonstrated”, Thermochimica Acta 382 (2): 95–100, doi:10.1016/S0040-6031(01)00832-2. Shanahan, Kirk L. (April 2005), “Comments on “Thermal behavior of polarized Pd/D electrodes prepared by co-deposition““ (PDF), Thermochimica Acta 428 (1–2): 207–212, doi:10.1016/j.tca.2004.11.007. Shanahan, Kirk L. (15 February 2006), “Reply to ‘Comment on papers by K. Shanahan that propose to explain anomalous heat generated by cold fusion’, E. Storms, Thermochim. Acta, 2006” (PDF), Thermochimica Acta 441 (2): 210–214, doi:10.1016/j.tca.2005.11.029, ISSN 0040-6031, OCLC 825205. Shkedi, Zvi; McDonald, Robert C.; Breen, John J.; Maguire, Stephen J.; Veranth, Joe (1995), “Calorimetry, Excess Heat, and Faraday Efficiency in Ni-H2O Electrolytic Cells”, Fusion Technology 28 (4): 1720–1731, ISSN 0748-1896. Simon, Bart (2002), Undead science: science studies and the afterlife of cold fusion (illustrated ed. ), Rutgers University Press, p. 49, ISBN 978-0-8135-3154-0. Storms, Edmund (2007), Science of Low Energy Nuclear Reaction: A Comprehensive Compilation of Evidence and Explanations about Cold Fusion, Singapore: World Scientific, ISBN 981-270-620-8, (book review in Contemporary Physics Volume 49, Issue 5, 2008 DOI: 10.1080/00107510802465229). Storms, Edmund (October 2010), “Status of cold fusion (2010)”, Naturwissenschaften (online) 97 (10): 861–881, Bibcode:2010NW…..97..861S, doi:10.1007/s00114-010-0711-x, PMID 20838756. Szpak, Stanislaw; Mosier-Boss, Pamela A.; Miles, Melvin H.; Fleischmann, Martin (2004), “Thermal behavior of polarized Pd/D electrodes prepared by co-deposition”, Thermochimica Acta 410: 101, doi:10.1016/S0040-6031(03)00401-5. Tate, N. (1989), “MIT bombshell knocks fusion ‘breakthrough’ cold”, Boston Herald (May 1, 1989): 1, ISSN 0738-5854. Taubes, Gary (15 June 1990), “Cold fusion conundrum at Texas A&M”, Science 248 (4961): 1299–1304, Bibcode:1990Sci…248.1299T, doi:10.1126/science.248.4961.1299, PMID 17735269. Taubes, Gary (1993), Bad Science: The Short Life and Weird Times of Cold Fusion, New York: Random House, ISBN 0-394-58456-2. US DOE, U.S. Department of Energy (1989), A Report of the Energy Research Advisory Board to the United States Department of Energy, Washington, DC: U.S. Department of Energy, retrieved 2008-05-25. US DOE, U.S. Department of Energy (2004), Report of the Review of Low Energy Nuclear Reactions (PDF), Washington, DC: U.S. Department of Energy, archived from the original on 2008-02-26, retrieved 2008-07-19. Van Noorden, R. (April 2007), “Cold fusion back on the menu”, Chemistry World, ISSN 1473-7604, retrieved 2008-05-25. Rogers, Vern C.; Sandquist, Gary M. (December 1990), “Cold fusion reaction products and their measurement”, Journal of Fusion Energy 9 (4): 483–485, doi:10.1007/BF01588284. Voss, David (March 1, 1999), “What Ever Happened to Cold Fusion”, Physics World, ISSN 0953-8585, retrieved 2008-05-01. Voss, David (May 21, 1999), “‘New Physics’ Finds a Haven at the Patent Office”, Science 284 (5418): 1252, doi:10.1126/science.284.5418.1252, ISSN 0036-8075, retrieved 2009-07-18. Wilford, John Noble (April 24, 1989), “Fusion Furor: Science’s Human Face”, New York Times, ISSN 0362-4331, retrieved 2008-09-23. Wilner, Bertil (May 1989), “No new fusion under the Sun”, Nature 339 (6221): 180, Bibcode:1989Natur.339..180W, doi:10.1038/339180a0. Wilson, R.H.; Bray, J.W. ; Kosky, P.G. ; Vakil, H.B. ; Will, F.G. (1992), “Analysis of experiments on the calorimetry of LiOD-D2O electrochemical cells”, Journal of Electroanalytical Chemistry 332: 1–31, doi:10.1016/0022-0728(92)80338-5. Britz, Dieter, Britz’s cold nuclear fusion collection, retrieved 2011-07-29. . Lists books, papers and conferences about cold fusion; has graphs of publication rate over time. This article uses material from the Wikipedia article Cold Fusion, which is released under the Creative Commons Attribution-Share-Alike License 3.0.